Dimensions:65W x 21 3/4D x 72H in. 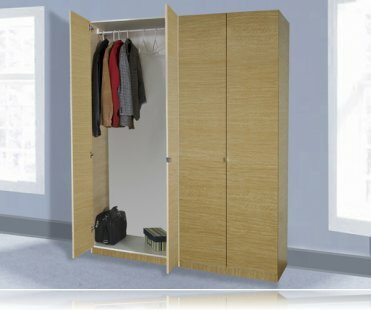 This beautiful wardrobe is designed to fit all your needs by providing a spacious area to hang your clothing behind its double doors while looking elegant and attractive in your home. 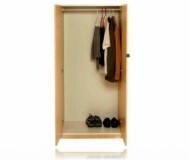 Store all your shoes as well as other large items and accessories on the bottom shelf. 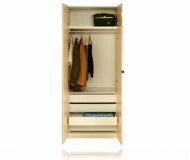 This storage closet will complement any decor while making your bedroom or kids room tidy and clothes hidden. Available in a variety of appealing color and mirror finishes, our storage armoire furniture can accommodate additional adjustable shelving, to make your perfect storage solution. Our armoire storage furniture will add a touch of class to your bedroom, laundry room, basement or garage. 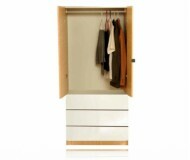 These wardrobe cabinets use high quality construction to provide full-length enclosed storage of clothing and garments. Rod measures 1in. in diameter, and 31in. long. Also available additional 14in. tall storage cap. MSRP: $999.98 $599.99 Seen it for less?